Standing atop the crest of Half Dome, with El Capitan and Glacier Point enclosing the sparkling wash of the Merced River as it wends its way through Yosemite Valley, you take a breath. Clear, piney air fills your nostrils. Eyes closed, you quiet your breathing, intent on hearing fully the haunting silence of the untrammeled wilderness about you. Instantly, reality smacks you in the face. You’re in Yosemite Valley. It’s the middle of June. What you hear between gusts of wind is haunting, sure, but it’s not very wild: a thousand generators-hooked up to RVs, trucks, and SUVs-clattering, groaning, and sputtering in the service of god knows what (TVs? Microwaves? Electric easy chairs?). You are faced with a sudden dilemma: recoil in horror and snobbery, or smile at humankind’s mechanical ingenuity? Pick your side carefully, and then start hollering, because there’s a fight playing out right now in federal court that’s got your name on it. Since John Muir first convinced the powers that be in Washington to designate Yosemite a national park in 1890, a raucous debate has raged regarding Muir’s “incomparable valley.” Like all good debates, it invites the most delightfully purple brand of self-righteousness. The issue centers on the question: How many people should be allowed into Yosemite Valley and what should they be allowed to do there? The debate’s latest incarnation pits the National Park Service against a duo of small environmental groups; at issue is whether a Park Service plan to restore and preserve the valley is, in fact, in the best interest of the valley and its visitors. Early on, the courts appeared to be siding with the environmentalists. 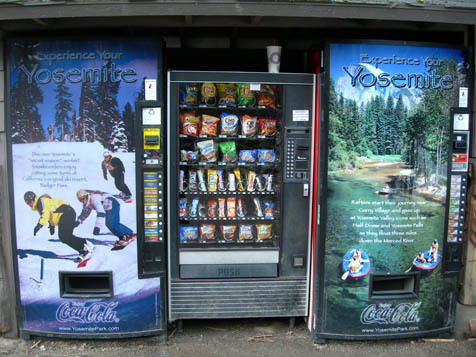 In July 2006, a federal judge upheld a lawsuit against the Park Service, charging it with illegally refusing to address visitor capacity in Yosemite Valley and of embarking on commercial developments that encourage more visitation, further threatening the park’s ecosystem. In November, Judge Anthony Ishii issued an injunction against all current construction projects in the park, which together amount to nearly $100 million of work, according to a park official. But in March, the judge lifted the injunction. The San Francisco-based Ninth U.S. Circuit Court of Appeals will hear oral arguments in the case this summer. The federal government has filed an appeal, fearing a visitor cap at Yosemite could open the door to limiting mandates for other parks, a development the government opposes. “It’s getting a great deal of attention in the agency,” said Kerri Cahill, a Denver-based planner for the Park Service. “It’s too early yet to say what the implications [for the other parks] are going to be.” She said the official stance of the Park Service is that visitor limits are unnecessary. Interestingly, the court battle has major environmental groups arrayed against one another. The Natural Resources Defense Council (NRDC) and the Sierra Club, to name two, find themselves in the unusual position of staring at each other across the divide created by the Yosemite issue, with the NRDC a supporter of the Park Service’s plan and the Sierra Club a detractor. (The Sierra Club did not participate in the lawsuit brought against the Park Service, but it signed an amicus curiae brief in support.) How did things get so nasty? “The flashpoint [of the current debate] was the ’97 flood,” said Geoff Green, a former Yosemite park ranger who heads the nonprofit organization Fund for Santa Barbara. “The flood really forced the question.” Green was referring to three rain-soaked days in January 1997, when torrential downpours combined with a slew of meltwater to create a massive overflow in the Merced River. At points 16 feet high, the flood washed away trees, roads, campsites, cabins, buildings, and sewer and sanitary infrastructure. The flood’s immediate aftermath witnessed a curious coalescence of disparate groups and individuals, all of whom recognized a historic opportunity had opened in Yosemite Valley. After years of hemming and hawing over how to handle conservation in the park, which pretty much everyone agreed was in trouble, the flood created a clean slate: Now the valley could be restored, and restored right. In recognition, Congress did what Congress does, drawing up a bill allotting the National Park Service $220 million for Yosemite, and ushered it out with a series of heartfelt speeches about nature and the spirit of American adventure (no word on the number of times John Muir’s name was invoked). In decades prior to the flood, debate had been steadily building regarding whether there was too much traffic in the valley. Yosemite National Park is large, but the valley itself relatively small-seven miles long and one mile wide. Of the park’s three-and-a-half million yearly visitors, 95 percent go exclusively to the valley, whose high walls and narrow floor act as natural buffers against the dispersal of pollution, of both the carbon and noise varieties. In 1981, a General Plan was drawn up to curtail some of the environmental and overcrowding concerns; it foundered long before 1997. 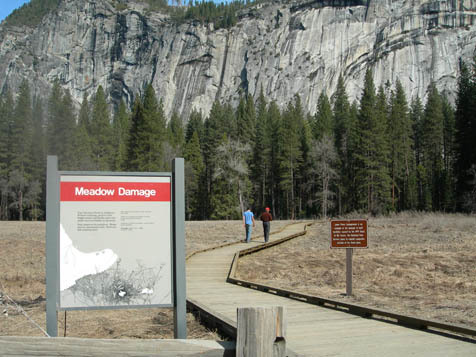 But the galvanizing force of the flood helped finally put the General Plan to use, in this case as the blueprint for the Yosemite Valley Plan (YVP), which was released in March 2001. According to the Park Service, this new plan would make visiting the valley more efficient and ecologically friendly. The projected cost was $442 million. A sibling plan to protect the Merced River, which runs for 80 miles through the park and winds its way picturesquely through the valley, was released three months before the Yosemite Valley Plan and was appropriately titled the Merced River Plan. Both projects were endorsed by the Wilderness Society, the National Parks Conservation Association, the American Alpine Club, and the NRDC. The New York Times, Los Angeles Times, and San Francisco Chronicle published supportive editorials, and perhaps because of this favorable press coverage, Californians responded enthusiastically when the NRDC conducted a statewide poll just after the YVP was released. But not everyone was so enamored with the park’s vision for Yosemite Valley. Two Yosemite-area environmental groups, the Friends of Yosemite Valley (FYV) and Mariposans for Environmentally Responsible Growth, sued in 2001 to stop the Merced River Plan, which they said was development friendly and illegal. Among other claims, the lawsuit argued, as FYV Director Greg Adair put it in an interview, “The park is under a legal mandate to at some level : weave in an actual numeric of use” for the valley. The suit was first upheld by the Ninth Circuit Court of Appeals, and then for a second time by U.S. District Judge Ishii last July. Ishii ordered the Park Service to come up with a new plan for the Merced River, which the service says will take more than two-and-a-half years. Further complicating matters, the two environmental groups filed a new complaint in late December arguing the YVP has to be rewritten-and they’ve promised they will sue, if necessary, to see that it happens. According to the complaint, the fact that the YVP is based largely on a defunct General Plan and a (now) invalid Merced River Plan renders it obsolete. Nonsense, said Scott Gediman, Yosemite’s chief spokesman. Gediman pointed out that, in total, 48 acres would be restored under the plan (37 already have been); “there’s less asphalt now than there was before the flood, and there will be even less if we prevail under the appeal”; “construction is a part of restoration”; and the plan would result in fewer houses overall. When Gediman talks about “managing” the park, he’s referring to a number of techniques established by the National Park Service throughout the years to help ameliorate the problems associated with dense, high-impact tourism on natural places. Chief among these are dispersal strategies, hardening trails, concentrating visitation, and cutting back on traffic. In practice, this means paving or putting up boardwalks on eroded trails; more buses running more frequently through more locations in the park; the placement of wooden fences and/or signs warning people to keep out of heavily impacted areas (for example, part of the river popular among summer bathers might be fenced up); and a number of other measures. The boardwalk across Ahwahnee Meadow. Gediman and Adrienne Freeman, another park employee, made extensive mention of the boardwalk installed in the Ahwahnee Meadow by way of promoting what they call their “user capacity program” to limit human impact on the valley. The boardwalk, they pointed out, allows people to venture out into the meadow-to enjoy the open expanse, to watch the sunset inch its way up Half Dome-without trampling the grass or churning up the topsoil. They also pointed out if they win on appeal, the YVP will see the creation of a new RV camp with 30 electrical hookups, eliminating the noise and carbon pollution of the vehicles’ generators. Considering that the Park Service is a federal agency, its reluctance to discuss visitor limits-much less an actual cap-at Yosemite and elsewhere seems understandable. The national parks are a major part of the United States’ cultural heritage, and it is the Park Service’s job to ensure Americans get to enjoy them. Yet if Adair and his cohorts are correct, open-ended visitation is not compatible with the conservation of Yosemite and, by implication, other impacted parks. This issue of how to balance accessibility with conservation is only likely to become more urgent in time, as the population grows and ecosystems become more fragile. Like everyone else, Santa Barbarans will have to wait to see how the Park Service’s appeal fares; in the meantime, it may be advisable to plan a trip to Yosemite to consider the issue firsthand.